No time for roasting a whole chicken and preparing broth after? Break out the slow cooker, friend. I’m about to blow your mind! 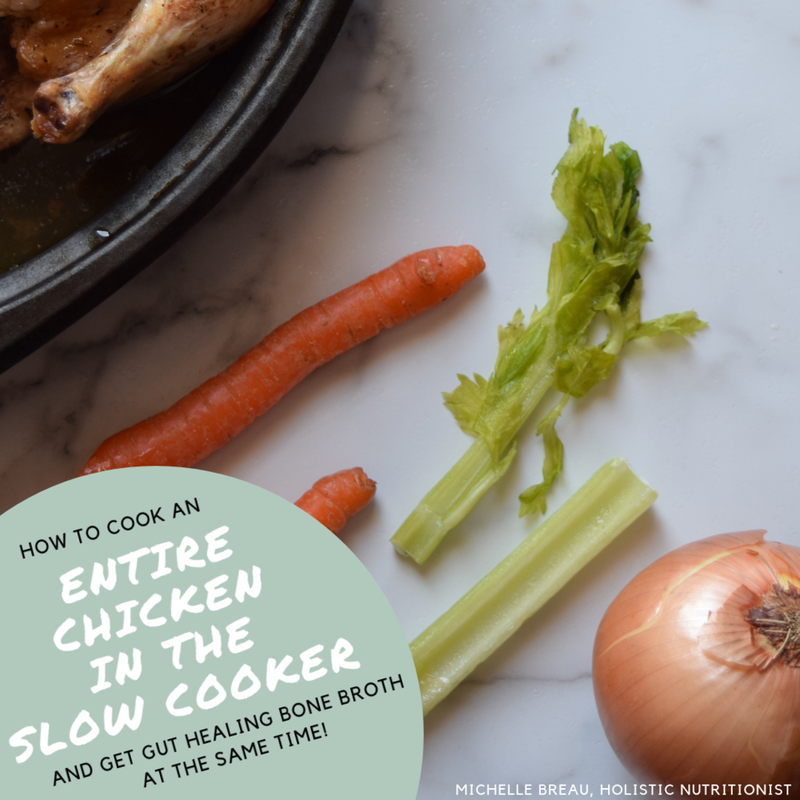 When it comes to chicken, I love using my slow cooker for a number of reasons. For starters, it is the easiest method of cooking it (in my personal opinion), there is very little mess to clean up, and it comes out perfect every time. I also love it because when the chicken is done, you can simply take it out, remove the meat from the bones for meals throughout the week, toss the bones and bits back in the slow cooker with some carrot, onion, celery, a bay leaf and some filtered water, let it go for another few hours and BOOM - You've got bone broth too! Bone broth is toted for its healing properties. It’s rich in collagen, which can be beneficial for good digestion, glowing skin, hair and nails. If you’re someone who struggles with digestive issues, you may have even tried incorporating bone broth to help in healing your gut. I personally love sipping a mug of broth first thing in the morning on an empty stomach to break my fast. Here’s where it gets tricky for my digestive health homies: The animal’s skin, bone and cartilage (used in making broth) contains something called “glucosaminoglycans,” or “GAGS” for short. Some people with digestive issues or sensitivities may actually find they are sensitive to bone broth because they tend to react to the GAGS in their broth. (Some folks with digestive issues struggle with onion as well, so if this is you, you may want to leave it out!). If you’ve ever found you are having a reaction to bone broth, you might do best with an amino acid broth instead. To make this type of broth, simply use the meat to make your broth instead of the bones and cartilage. Some folks also react to histamine in broth, which is why I tend to only simmer it in the slow cooker for 2-3 hours instead of overnight. So without further adieu, let's get into it! Rinse chicken under cold water and remove any missed feathers. Rinse the outside AND the inside well, then transfer, breast side up to your slow cooker. Rub avocado oil on the skin with herbs of choice (I like to keep mine simple with black pepper, pink salt, dried parsley and oregano). Cook on low for 8 hours, or high for 5-6 hours (or until the temperature in the thickest part of the breast reads 180 degrees). When it’s cooked through, simply remove meat from the bones, leaving the carcass and all liquids in the pot. Serve with any veggies or sides of your choice. Add carrots, celery, bay leaf, onion, apple cider vinegar and water to the bits left in the slow cooker, then cook for 2-3 hours on high. Unplug and let everything cool down a bit before straining the liquid into a separate dish. I usually use tongs to scoop out as many solid bits as I can, then I strain the rest through a fine wire strainer. Transfer liquid to jars and seal tightly. Once cooled, transfer to the fridge. In the morning, any excess fat will have risen to the top of the jar, and you can now easily scoop it out and discard it. Tip: The more narrow the jar you store it in, the easier it is to scoop the fat off the top. Just be sure to fill it right up so it’s easy to reach! Before adding the chicken to the slow cooker, add a handful of carrots to the bottom of the pot. The amino acids and collagen-rich goodness will cook into them, leaving you with the most delicious, nourishing carrots you’ve ever tasted. Enjoy! I want to know: What are your favourite things to use the slow cooker for? Share your best ideas in the comments below!